When you spend five months of your life hiking 2,650+ miles, it’s hard not to get caught up in the numbers. The PCT hiking season is very short, usually from March until October each year. Depending on Mother Nature, the season can be a little longer or a little shorter. Most people give themselves five months to complete their thru-hike from Mexico to Canada. Thru-hiking is far from a perfect science though. 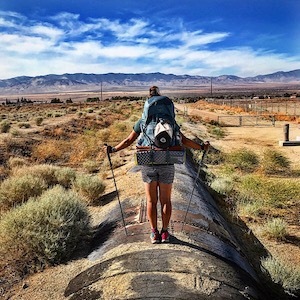 There are many different factors that can influence ones thru-hike out here along the PCT: weather, injury, funds, family issues, visa issues, being homesick, job commitments or even figuring out that thru-hiking isn’t for them. In a nutshell, we’re all in a race against time, yet once you get out here, all you want to do is have a good time. I’m concerned about numbers, to a point. I set daily hiking mileage goals for Grit and I each day, based on our realistic pace and the distance from our next town stop. I believe in the “Smiles Not Miles” philosophy out here on the trail though. I don’t care how fast I hike or how soon it takes us to get into town. All I care about is our safety, that we don’t run out food and water, we both stay injury free and enjoy ourselves while we’re out here. What fun is it to be out here every day, working as hard as we do if we can’t enjoy ourselves? Some hikers get caught up in the daily mileage game. “I’m doing 30 mile days…blah, blah, blah.” Who cares? These are usually the same people, usually Ultralighters, who get super caught up in the gear their using along with how many ounces (not pounds) of weight they’re carrying. That may work for some, but if I’m going to be out here working as hard as I do, I want to be happy and comfortable while I’m doing it. Even if it means carrying a few more ounces. We ALL want to make it to Canada, Grit and I probably most of all because we’re the last of our beloved “Team Lagger” trail family left hiking the trail. But if I’m going to be out here hiking 12 hours a day, every day, I want to enjoy myself while I’m doing it. If there’s a river to swim in and it’s hot out, I’m going to stop and get in it. If there’s a lodge 0.7 miles off trail that has amazing, home cooked food, I’m going to stop and eat there. If the general store has hand scooped ice cream, you better believe I’m coming in for some. If I run into another hiker who I like and haven’t seen in awhile, I’m going to stop and chat with them. I also break for cool bridges, alpine lakes, ridge lines, views of ski resorts and trail magic. I ALWAYS stop for trail magic. Grit and I have been keeping on track with our tentative schedule into Belden. We’ve been doing 20+ miles a day and that’s with a lot of “up” in this section. The trail in Northern California seems to only go up in elevation gain, except for the massive “down” into Belden tomorrow. But that’s only about six miles or so. To keep on schedule, we’ve also been taking Neros instead of Zeros when coming into town. This means instead of taking a whole day off from hiking, we hike either a few miles in the morning coming into town or a few miles coming out of town. My body is tired and feeling all the mileage. I know Grit is feeling it too. So to celebrate Grit’s upcoming birthday, our reaching the halfway marker on the PCT and to take a good old fashioned break, we’re planning on taking a proper Zero Day in a few days when we come into the town of Chester. It’s important to stay on task out here and avoid getting sucked into the town vortex. It’s also perfectly acceptable to give yourself a break every now and then and enjoy the hike while we’re out here. We’re making memories for a lifetime. I want them to be good ones. This is exactly why I believe in the “Smiles Not Miles” philosophy out here on the PCT. « What Is Trail Magic?